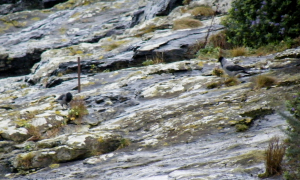 Observation - Hooded Crows feeding near top of splash zone - UK and Ireland. Description: Two Hoodies searching among vegetation on rock at high water. Two Hoodies searching among vegetation on rock at high water.